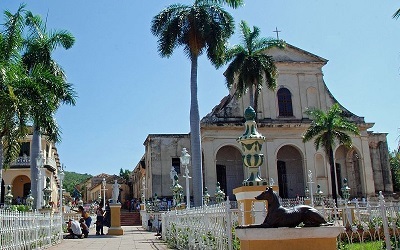 Learn more of Central Cuba&apos;s history! 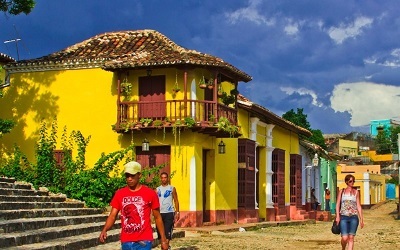 Two capital cities of central Cuba are within the rural heart of Cuba. Such cities treasure visible Spanish traits in its architecture and local customs. 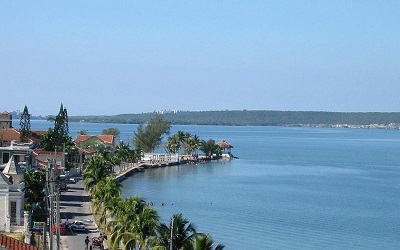 Cienfuegos, founded by French in 1819, is a maritime town with well-preserved historical buildings and one of the most captivating bays in the Caribbean Sea. Its historical center was declared World&apos;s Heritage Site by UNESCO in 2005. 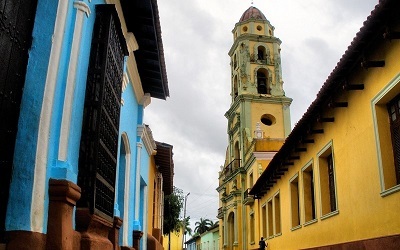 Trinidad, one of the first seven villages founded in Cuba (1514) which still seems slept in time, was declared World Heritage Site by UNESCO in 1988. A city where the architectural wealth makes you travel back in time thanks to conservation and restoration of buildings. Departing from Havana: 07:00-20:30 (3 hrs drive to Cienfuegos). Departing from Varadero: 06:30-19:30 (2´30 hrs drive to Cienfuegos). 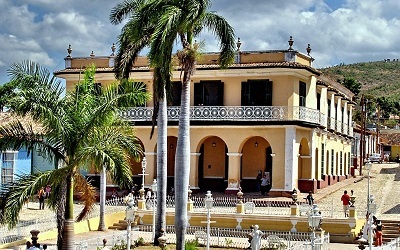 Drive to Cienfuegos through farmers&apos; villages, valleys and plantations of sugar cane, bananas, citrus fruits, etc. Visit to the heart of Cienfuegos (Tomas Terry Theater, Purísima Concepcion Cathedral, Ferrer&apos;s Palace, former City Hall, Marti Park, the triumphal arch). Free time to walk along the Boulevard. Visit to Punta Gorda (the aristocratic quarter of the city in the early 1900&apos;s), Valle&apos;s Palace and Hotel Jagua). Drive for 1´30 hrs to Trinidad bordering the Caribbean Sea with an exclusive panoramic view of the Guamuaya Mountain Range. 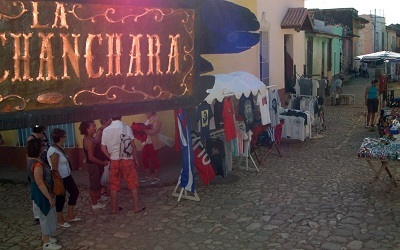 Walking tour around the Santísima Trinidad Cathedral, former Basilica Saint Francis of Assisi, Cantero&apos;s, Brunet&apos;s and Iznaga&apos;s Palaces, and drink a local “Canchanchara”. Optional visit to the Romantic Museum (admission fee: 2.00 CUC per person) or the Municipal Museum (admission fee: 2.00 CUC per person). Optional visit to a flea market. Founded in 1819, it is a maritime town with well-preserved historical buildings and one of the most captivating bays in the Caribbean Sea which helped the city earn the name “Pearl of the South”. The town was planned according to geometric layout typical of Neo Classicism, compact constructions and stylistic homogeneity. Martí Park and the surrounding buildings, Prado promenade, the city´s seafront, Valle´s Palace and Punta Gorda are a must for any visitor. This theater was built in 1886-90 to fulfill the last will and testament of Tomás Terry Adams, a sugar factory owner. World famous personalities such as Italian Tenor Enrico Caruso, French actress Sarah Bernhardt performed here in the early 1900´s. The austere well-proportioned façade shows three ceramic masks “Three Graces” on the pediment made by Salvatti workshops in Venice. 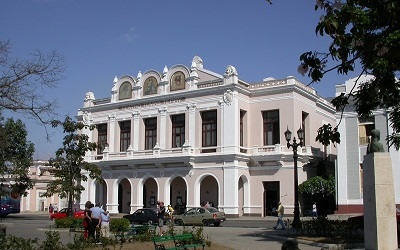 It was built in the early 1900´s by the sugar magnate José Ferrer Sirés and houses today the Provincial Culture Center. Enrico Caruso is said to stay here when he performed at the theatre. It is distinguished by its cupola with blue mosaic decoration and the wrought iron spiral staircase. It was constructed 1833-1869 and features a Neo Classical façade with two bell towers of different heights and stained glass windows made in France depicting the Twelve Apostles. 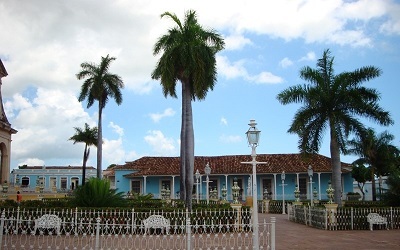 The most amazing building in the area, located in Punta Gorda, was a wedding gift of Acisclo del Valle Blanco, one of the wealthiest sugar merchants in Cuba, to his wife. It was built in 1913-1917 at a cost of 1.5 million pesos by French, Arab, Italian and Cuban architects. The facade has three towers of different designs symbolizing power, religion and love. 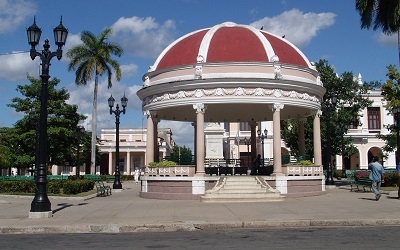 A large nautical rose in the middle of the park marks the zero kilometer, the central point of Cienfuegos city where it was founded in 1819 laying out the city´s first 25 blocks. This park along with the surrounding buildings, the historical center of the city, was declared World Heritage Site in 2005. The only triumphal arch in Cuba and two lions on marble pedestal flanking a monument of Jose Martí stand in the park. 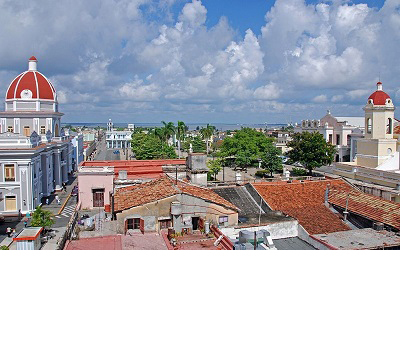 At the southern tip of the bay of Cienfuegos lies Punta Gorda, the aristocratic quarter of the city in the early 1900´s which affords a lovely panoramic view of the bay. Several wooden Art Nouveau villas were modelled here on the American pre-fabricated “balloon frame” homes that were so much in vogue in the early 20th century. Founded by Diego Velazquez in 1514, it was declared by UNESCO a World Heritage Site in 1988. 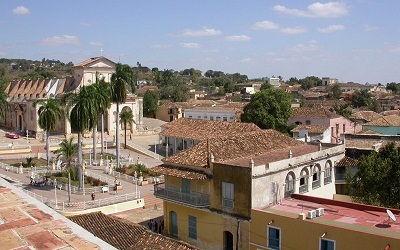 This city flourished between the 17th and 19th centuries thanks to sugar cane and slave trade, reflected in the buildings around the Main Square. The original cobble stone streets and pastel colored houses give the impression that time has scarcely moved on since colonial times. 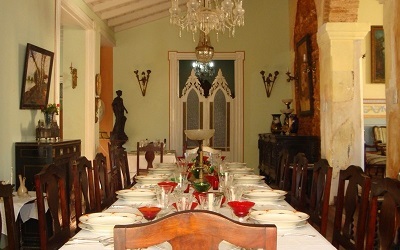 Trinidad offers a wide variety of architectural details such as red tile roofs, wooden beams, ornamental wrought iron grates and high windows which set slightly above ground level having strong wooden shutters. This 1892 built church with Neo Classical façade has four aisle interior and a Neo Gothic altar dedicated to the Virgin of Mercy. But the real attraction of this place is an 18th century wooden statue “Lord of the True Cross” made in Spain for a church in Vera Cruz which left Barcelona´s port in 1731 but three times the ship was driven by strong winds to the port of Casilda, 6 km from Trinidad. On its fourth attempt to reach Mexico the ship´s captain decided to leave behind part of the cargo which included the statue of Christ. Locals believed this was a signal from heaven becoming an object of worship. This church was built by Franciscan monks in the late 18th century. The authorities transformed the monastery into a garrison for the Spanish army during the 1890´s. 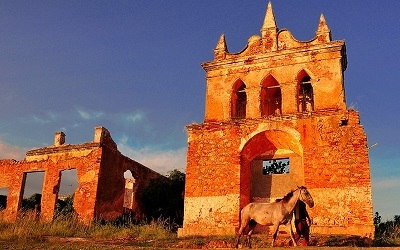 The convent and part of the church were demolished because of its deteriorated condition, only the bell tower and its clock are still standing along with adjacent buildings, which were used as school. The complex became the home of the Museum of the War against Bandits. This building was commissioned by Mariano Borrell Padrón and bought later by María de Monserrate who married Cantero, a landowner from the Sugar Mills Valley, who transformed it into one of the most sumptuous Neo Classical residences of Trinidad. It is now the Municipal Museum of History where local history can be traced here through exhibits, maps and monuments related to different themes: the Cantero family, piracy, the plantations of the Sugar Mills Valley the slave trade and the wars of independence. The tower has a commanding view of the historic center. 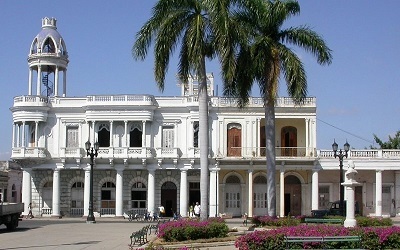 This building belonged to the sugar magnate Saturnino Sánchez Iznaga and is now the home of the Museum of Colonial Architecture. 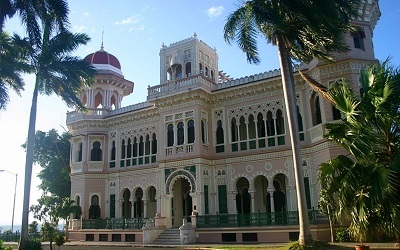 It covers the different architectural elements seen in Trinidad and illustrates the building techniques used during the colonial period. There is a collection of several locks, latches, doors, hinges, windows and grates. Built in 1812 as the residence of the wealthy Borrel family, it now houses the Romantic Museum whose decoration blends in well with the objects on display, most of which belonged to this family. It features precious wood furniture, Sevres vases, Bohemian crystal ware and other decorative objects from the 18th and 19th century. This small 18th century church on a hill north of the center is connected to the Main Square by a narrow steep street. The striking three arch bell tower loggia was added in 1812, when work was done to the church to repair the damage done by a cyclone. 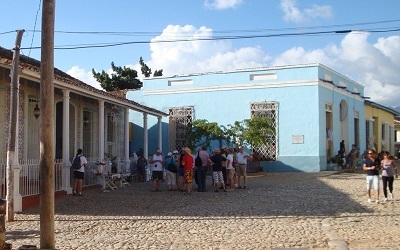 This 18th century building is known for a local traditional cocktail “Canchánchara”, made from rum, lemon, water and honey. This drink helped Cuban rebels “Mambises” to bear the cold weather and different respiratory diseases out in the fields during the independence wars in the 19th century. . 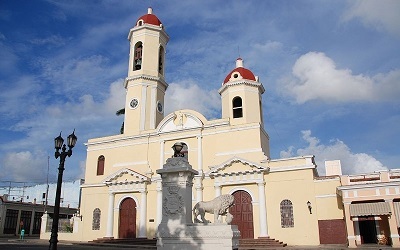 This is the city´s foundational site where Bartolomé de las Casas celebrated the first ecclesiastic mass in Trinidad in 1514 and where a Jigue tree still stands. This nice looking house, built in the early 18th century, with a wooden balcony on the corner was the meeting place for local nationalist members of the Conspiracy “Mina de la Rosa Cubana” in 1848.